This recipe was inspired by Andy Ricker’s Khai Luak Kap Khanom Pang Ping in The Drinking Food of Thailand. I have applied different cooking techniques. 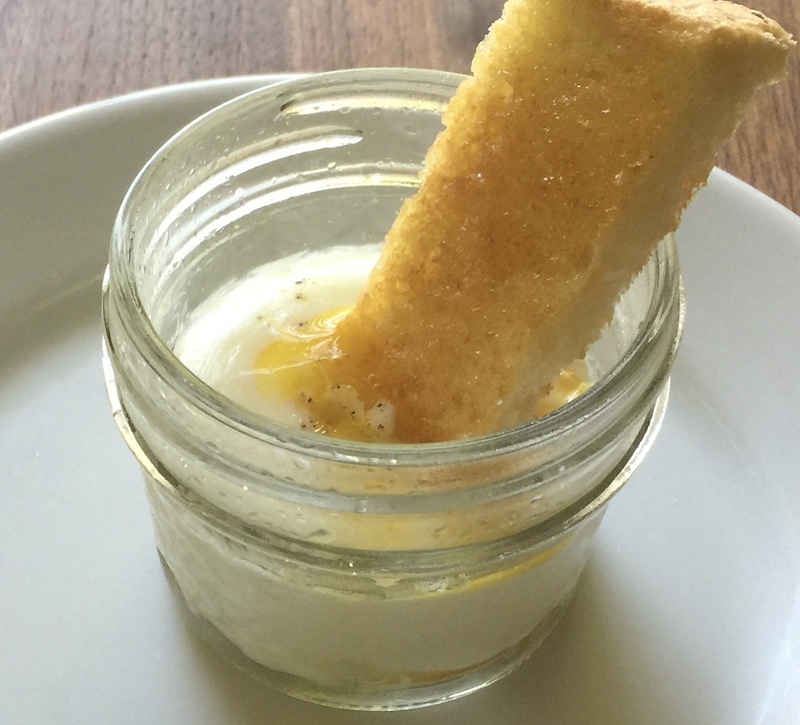 Coddled eggs are gently cooked and can run the gamut from hardly cooked to mostly cooked. 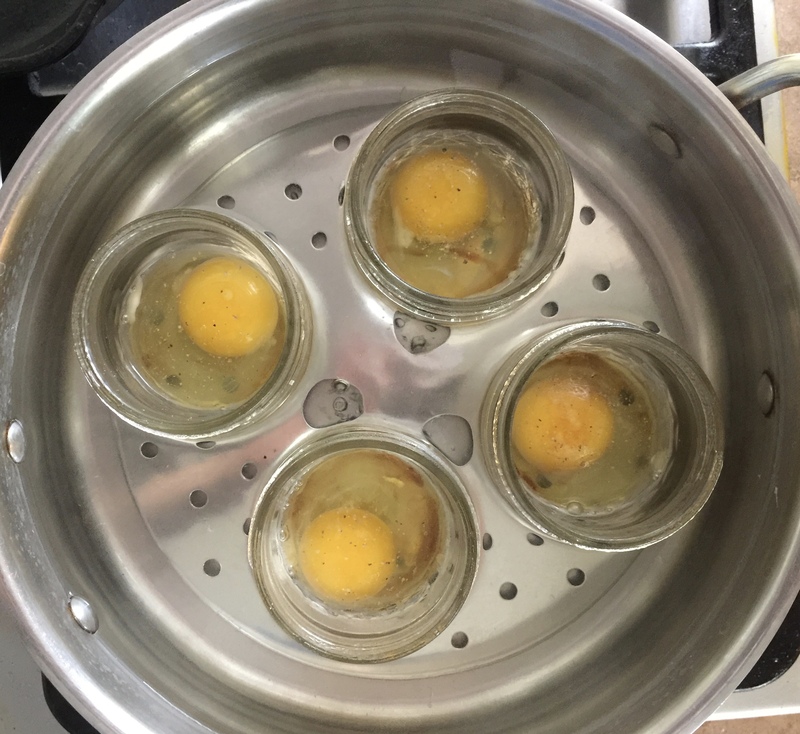 They are similar to poached eggs as they traditionally are barely cooked with an intact runny yolk, but whereas poached eggs are dropped directly in the water, coddled eggs are cooked in a simmering water bath (bain-marie) in a heatproof vessel. 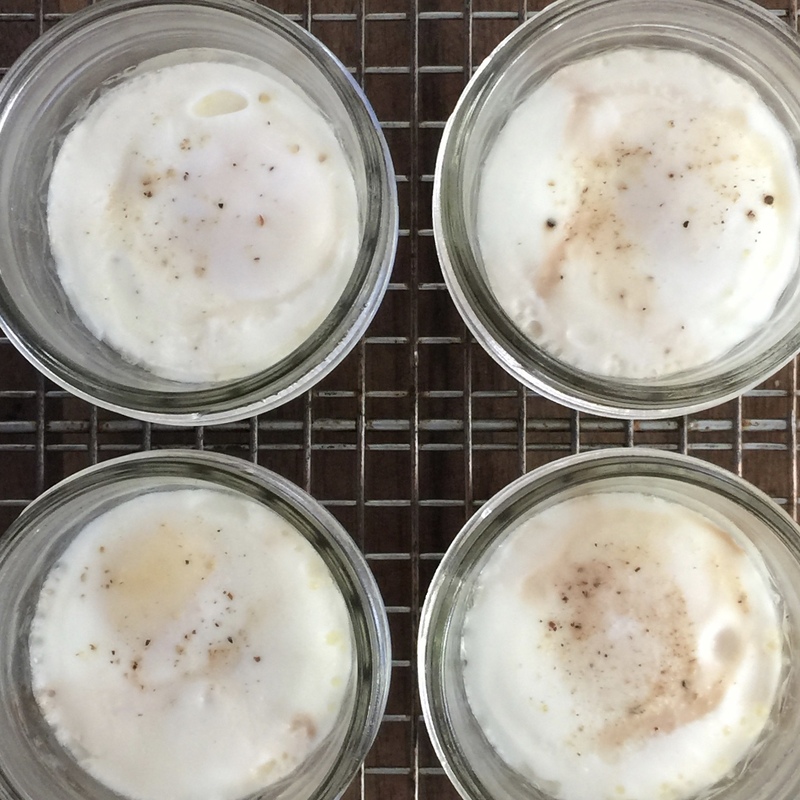 These coddled eggs are cooked in mason jars and given an extra umami kick with some Maggi seasoning. You could get egg coddlers, heat proof cups with lids, especially for this purpose, but I used some small 4 oz mason jars. Heat proof ramekins could also be used. You need a shallow pan with a tight fitting lid to make a bain-marie. Water should be 3/4 high on the jars. Test this with empty jars, keeping in mind the water will be displaced. 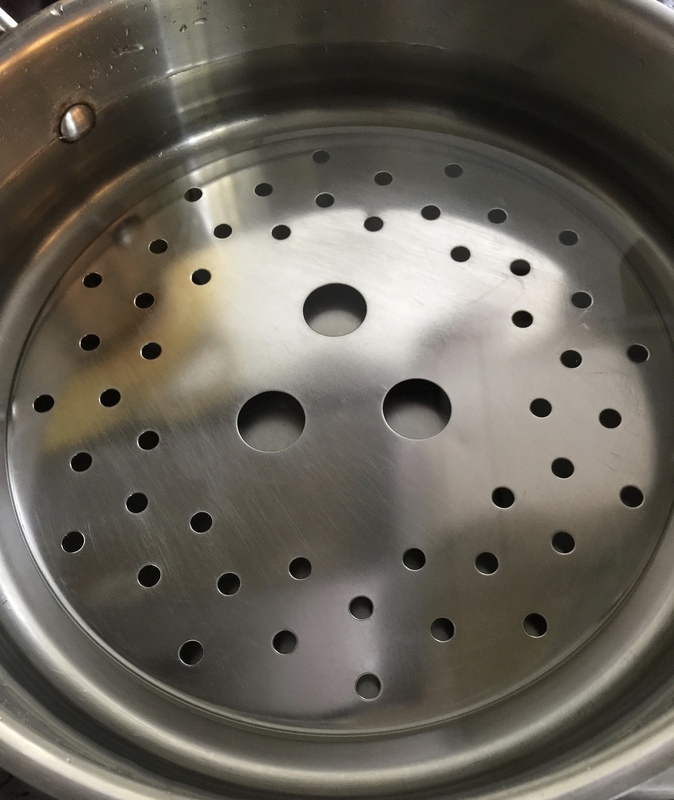 Put a trivet at the bottom of the pan to keep the jars from touching the bottom of the pan. Bring the water to a gentle simmer. The eggs are simply flavored with salt, freshly ground white pepper, and Maggi seasoning sauce, a dark thin hydrolysed vegetable protein-based (MSG) liquid condiment that was first developed in Switzerland in the 19th century. MSG gives the liquid a rich umami flavor that only requires a few drops for impact. MSG has been used to season food for a hundred years and the “Chinese restaurant symptom” has been shown to be a fallacy so feel free to enjoy your MSG. The jars should be buttered before cracking the eggs into them. Along with imparting flavor this will make cleanup easier. The eggs are cracked directly in the cups. Top with salt, pepper, and 3-4 drops of Maggi. Use a canning jar lifter to gently place the jars in the hot water. Although I’m not a fan of single use items these are definitely useful to prevent scalding yourself during canning. Carefully place the jars in the hot water. They should not touch the side or each other. Put on the lid. Cook for 7-10 minutes depending on how well cooked you like your eggs. In the meantime toast some bread, slather on butter, and cut into soldiers for dipping. Who can resist toasted bread with salty butter? Carefully remove the jars and place on heatproof surface. Serve with soldiers for dipping. Add water to the pan with the trivet so that it comes up 3/4 high on the mason jars. Bring to low simmer. Crack eggs into jars. Top with salt, pepper, and Maggi seasoning. Carefully place in pan. Place on lid. 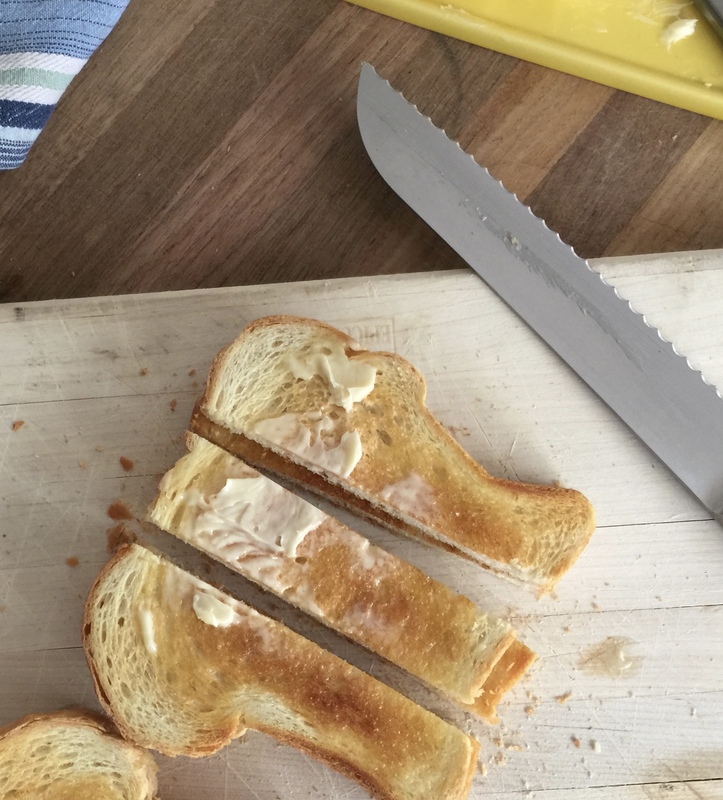 Meanwhile toast bread, butter, and cut into soldiers. 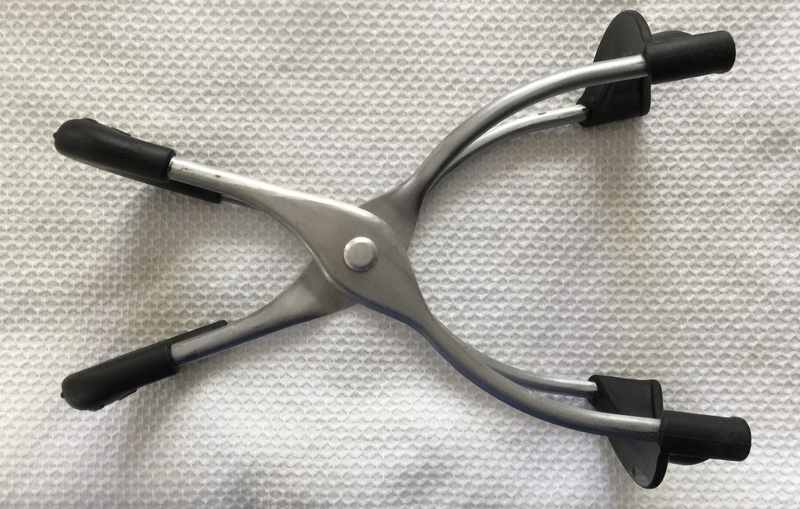 Remove eggs from pan using lifter. Place on heatproof surface until cool enough to handle.